Looking to feed your family this winter but want to get out of the kitchen? Try this slow cooker turkey – set it and forget it while you enjoy spending time with the kids over winter break. How many of you have kids that are excited to be off of school for two weeks? I bet a lot of you. While I don’t have kids myself, I do find that the two weeks off between Christmas and the New Year are great for visiting with family and friends. And all of my friends’ kids – I’m the best “Auntie Jenny” out there. Between winding down from all of the Christmas festivities and prepping for all of your New Year’s goals comes a lot of time. And I think that time should be spent with your loved ones instead of slaving in the kitchen. 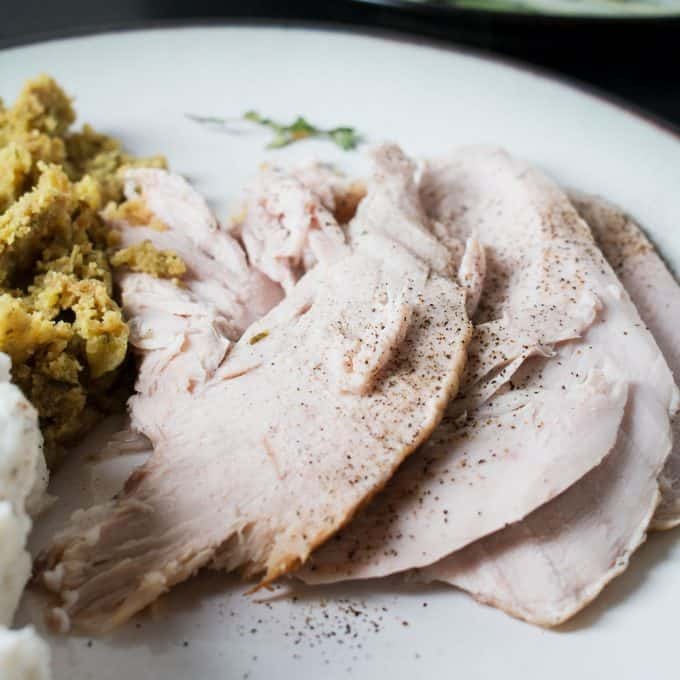 This slow cooker turkey recipe is great for holidays like Thanksgiving and Christmas but it’s even better for the whole year. Who said you can’t make a turkey in January? When making a turkey in the slow cooker, it is important to buy the smallest turkey possible. Also… the largest slow cooker you can find. It is going to be a tight fit no matter what but you can totally make it happen. If you can’t seem to get the lid to close – this happened to me – use foil to create a “seal” between the lid and the slow cooker base. Also, it is very, very important that you check the temperature with a thermometer in multiple spots. I like to put the turkey on a pan in the oven for a few minutes to give the skin that delicious brown coloring but it’s totally not necessary. As long as it has completely cooked through, you are good to go. Want to save even more time? Get all of your ingredients from Peapod!! 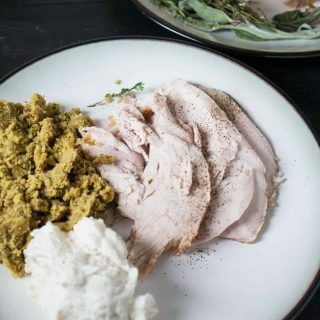 I created this recipe as part of my partnership with Peapod and the recipe website FromthePod.com. I’m part of a group of great food bloggers creating awesome recipes for all of your holiday parties with Peapod in mind. Get this recipe over on Peas from the Pod! Remove the neck bone and giblet bag of the turkey and use a paper towel to dry off the thawed turkey. Melt the butter in the microwave and liberally brush the turkey with the melted butter. Also make sure to get butter underneath the skin. Optionally, use your hands instead of a brush. Sprinkle salt and pepper on all parts of the turkey. 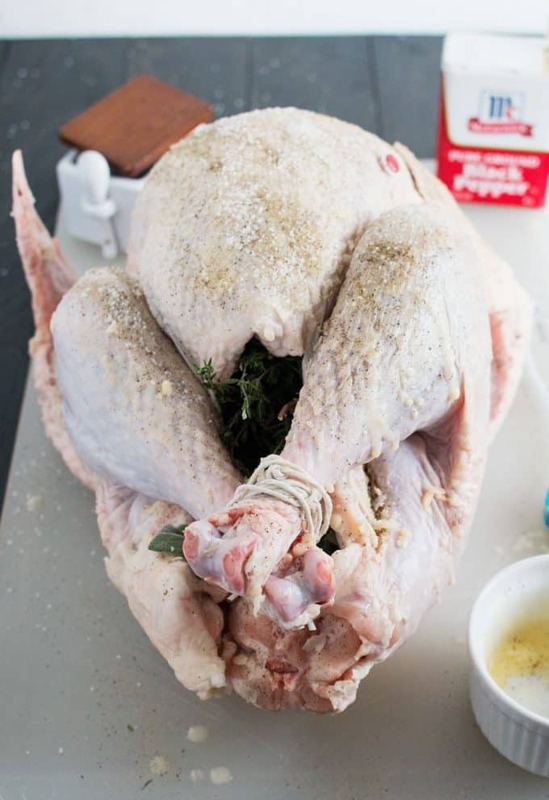 Make a bundle out of the rosemary, sage and thyme and insert into the turkey cavity. Add the crushed garlic cloves. Use kitchen twine to tie the legs together. Then carefully place the turkey into your large slow cooker. 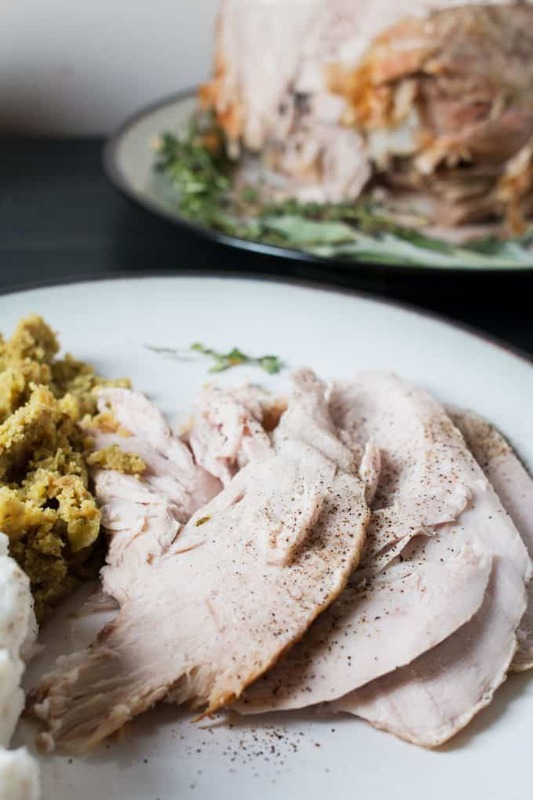 Depending on your turkey, you may need to flip the turkey on the other side to put it in your slow cooker. You also may need to untuck the wings. Place the lid on the slow cooker. If the lid doesn’t fully close, use foil to create a seal around your slow cooker lid. Cook the turkey on high for 2 hours and then reduce the heat to low for an additional 3-4 hours. 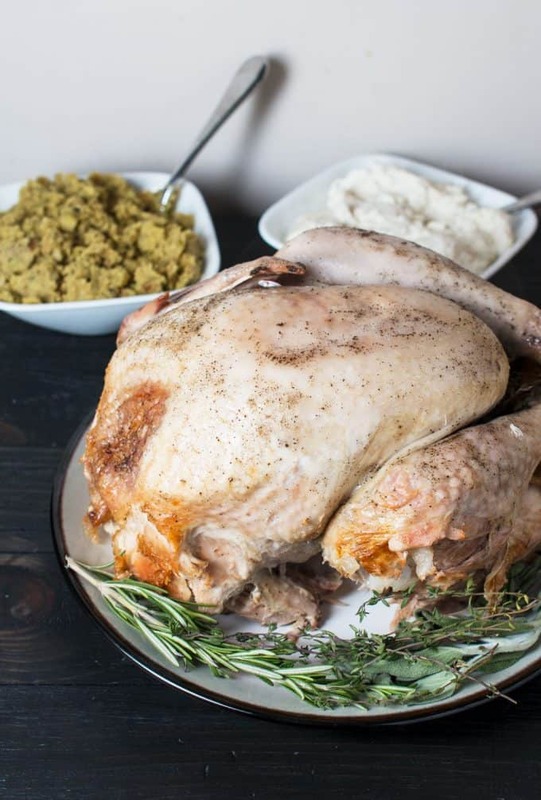 Use a thermometer to determine when the turkey is completely cooked - it should reach an internal temperature of 165°F. 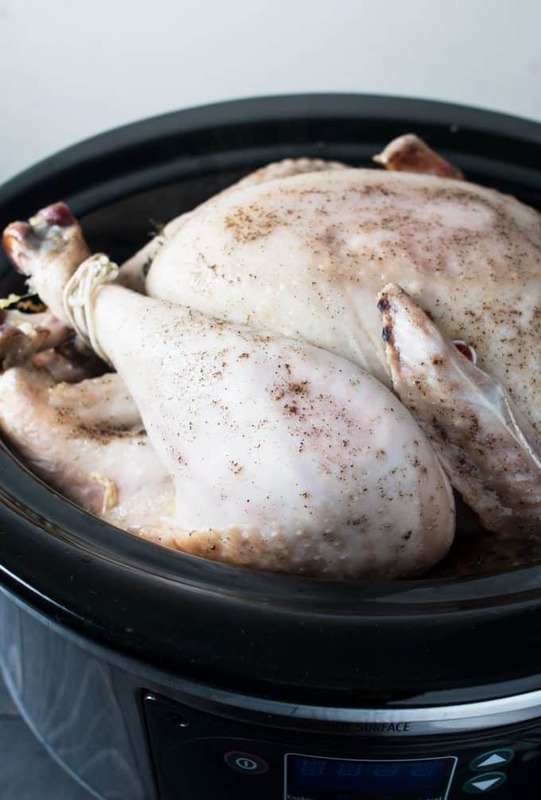 Carefully remove the turkey from the slow cooker, wait 10 minutes and then serve. Optional: If you would like the outside of the turkey to appear crispy, broil the turkey in the oven for 10 minutes prior to serving.